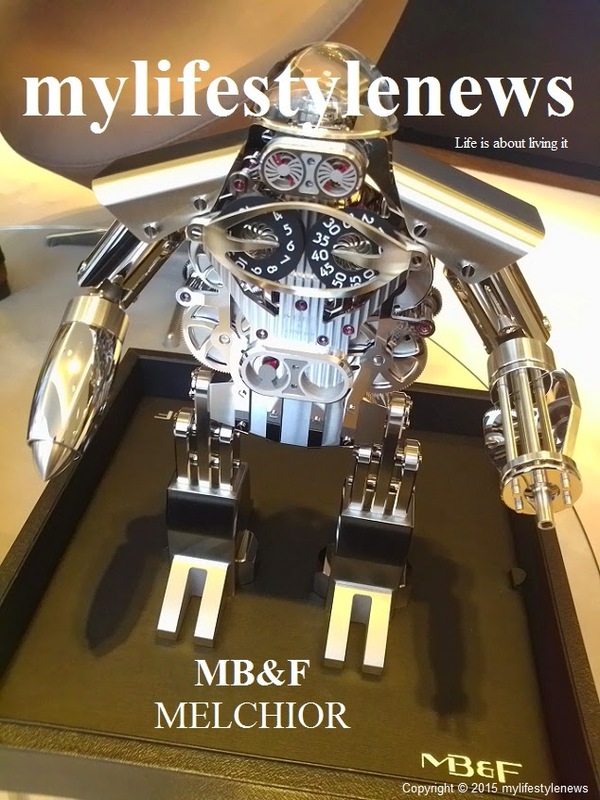 MB&F celebrates its first decade in 2015 and to commemorate this milestone, the Geneva-based Horological lab presents a number of Anniversary Pieces during the year, under the theme <A creative adult is a child who survived>. The first piece is Melchior, created with L’Epée 1839: an impressive kinetic robot which may remind you of your childhood dreams, but also happens to be an impeccably finished, 480-component mechanical table clock. With his smart steel and brass armour, enigmatic glint in his eyes, animated brain and muscular, articulated arms, the right one packing a rocket launcher, the left a Gatling gun. Melchior is the robot buddy you would want by your side while trying to thwart Darth Vader. But look again and you will see Melchior is a majestic high-end table clock featuring jumping hours, sweeping minutes, double retrograde seconds and a 40- day power reserve; a tribute to refined, classic clock- and watchmaking. Conceived and developed by concept lab MB&F, and engineered and crafted by L’Epée 1839, Switzerland's only specialised high-end clock manufacture – Melchior is the result of Maximilian Büsser’s quest to revisit his childhood hankering for a robot friend. “A long time ago in a galaxy far, far away, man’s best friend was his robot. As a 10-year-old fan of Star Wars, I knew Luke Skywalker could never have prevailed had it not been for droids like R2-D2 – a loyal, resourceful and brave robot who was always saving his friends. As an only child, I imagined having my own robot companion… Melchior makes that childhood fantasy a reality.” says Büsser. Christening this roboclock ‘Melchior’ after a traditional forename in his family, Büsser developed the concept with designer Xin Wang, selecting a high-end L’Epée clock movement and reimagining it as the mechanical head and torso of a robot. Jumping hours and sweeping minutes on Melchior’s chest are displayed via discs bearing MB&F’s signature numerals with pointers incorporated into the breastplate while a dial on Melchior’s abdomen is the power reserve indicator. And this robot’s self-sufficiency is to be admired, for the finely-finished, highly-visible movement boasts a power reserve of 40 days for most table clocks, it is eight days, thanks to five main spring barrels which help make up Melchior’s rippling torso. The barrels are in series for optimal performance. The retrograde action of Melchior’s expressive eyes marks off intervals of 20 seconds. A combination of fixed vents and revolving discs, both bearing radial propeller motifs, gives the impression that Melchior is closing and opening his eyes - the resulting blinking effect endows the robot with a hint of endearing human-like personality. Further animation is provided by the regulator, its gentle beating and intricate composition made visible thanks to its polished glass dome cover. If the protective dome acts like a skull, then the regulator symbolises Melchior’s brain at work; just as the brain governs the body, the regulator governs the clock’s remarkable precision. A true robot companion is one you can play with and Melchior doesn’t disappoint. His steel upper arms rotate and his lower arms pivot up or down excellent manoeuvrability for aiming his rocket launcher or Gatling gun to blast away the bad guys. 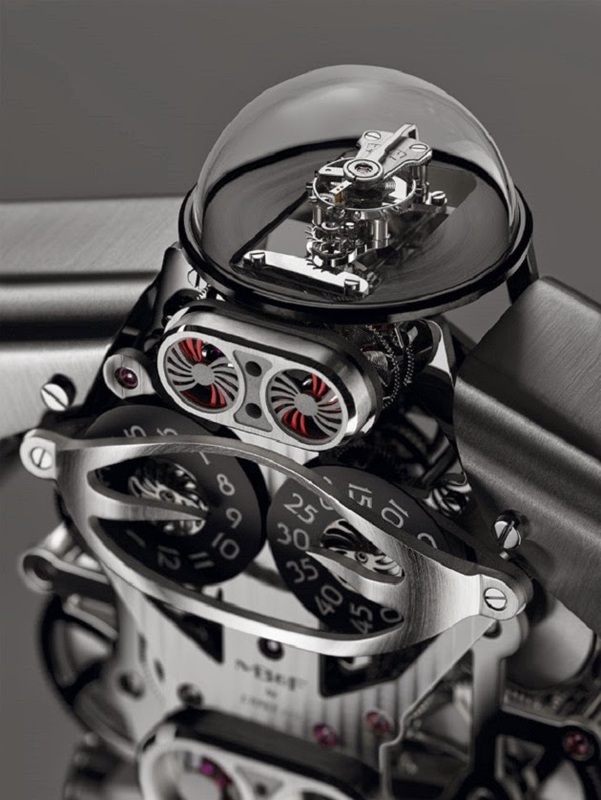 And in a neat design touch, his gun detaches and doubles as the winding/setting key for the movement. Melchior is limited to 99 pieces and is available in a monochromatic ‘light’ edition or a two-tone ‘dark and light’ edition featuring black PVD-treated components.